EQ2011 | EQUINOXYGEN FESTIVAL is the first large-scale event of its type ever to take place in the Northeast New Jersey area. 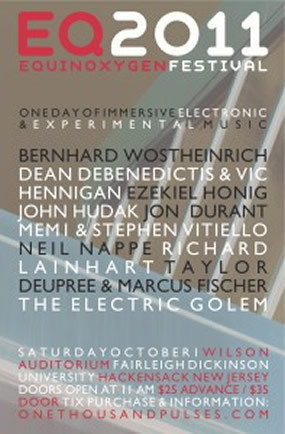 Hosted in the prestigious Wilson Auditorium on Fairleigh Dickinson University’s Teaneck/Hackensack campus, just 15 minutes north of New York City, Equinoxygen presents a single-day of provocative, experimental music. With a roster of renowned artists from across the globe, spanning the bandwidth of electronic music’s genres, styles, and approaches, Equinoxygen 2011 is the opening salvo in an annual series of festivals to take place in the region, bridging the analog and the digital, & the audio and the visual, to yield a unique sensorium of sound and image. BERNHARD WOSTHEINRICH elicits meaning from abstraction in electronic music and media whether as an artist, musician, painter, graphic designer, small town bohemian, or failed control freak. Using a compositional approach akin to his work as a visual artist, Wöstheinrich usually begins by improvising abstract sonic structures which are subsequently developed into an increasingly detailed aural picture, both in his own solo project as The Redundant Rocker, and in collaboration with colleagues Markus Reuter (as Centrozoon), Ian Boddy, Klaus Hoffmann-Hoock, No-Man singer Tim Bowness, Thorsten Niestrath, and Synapscape’s Philipp Münch. He has released music on a variety of labels such as DiN, Burning Shed, Tonefloat, and Unsung, and continues to push at the boundaries of rock, electronica, and the avant-garde. DEAN DE BENEDICTIS is a Southern California-based musician who has utilized his interest in a variety of styles and cultures to enrich the quality of his musical expression. Beginning his deep exploration of music in the 80′s, De Benedictis has covered a wide gamut of sonic experience, moving through many jazz-fusion and progressive rock bands, music theory classes, and producing/performing source music for network television. Known to the electronic/ambient community as Surface 10 (as well as under his given name), De Benedictis has realized numerous recordings for labels like Hypnos, Lektronic Soundscapes, Spotted Peccary, DiN, and Cleopatra, founding the Fateless Flows Collective and its subsequent imprint in 2004. De Benedictis has spent the last few years refining his own idiosyncratic approach to rhythmic & non-rhythmic-based musics, to the effect that after a period of dormancy, he is actively reviving Fateless Flows as a ongoing conduit for his colleagues and his own future endeavors. EZEKIEL HONIG is a New York City native, founder of the labels Anticipate and Microcosm, who concentrates on his idiosyncratic brand of emotively warm electroacoustic music across a breadth of quietly insinuating recordings and performances. Using the loop as more of a tool than a rule, Honig paints outside the lines, nestling into a comfortable, shared space between muted techno, melodic, event-driven ambient, textural downtempo and slowmotion house, using them as reference points from which to stray, rather than as steadfast frameworks. Honig looks to incorporate a material nature into his music by imbuing it with a host of field recording/found-sound sources in the search for a balance between digital software innovation and the physicality of the world around us. His improvisational approach combines loops and elements from various songs with on-the-fly arrangements, editing and effects. Honig has performed in numerous galleries and alternative spaces worldwide including Montreal’s Mutek festival, the Plateaux Festival in Poland, Fondazione Arnaldo Pomodoro in Milan, Italy, and the Detroit Electronic Music Festival. JON DURANT is a guitarist who brings a unique sense of texture and melody to his instrument. His distinctive “cloud guitar” soundscapes and engaging lead work have graced numerous CD recordings and film soundtracks. Either solo or in a group context, his myriad influences reference such colleagues as Fripp & Eno, Steve Tibbetts, David Torn, and the early work of Bill Frisell and Andy Summers. As executive producer of Alchemy Records, he produces recordings for internationally acclaimed artists in his small Massachusetts-based studio. In addition to longtime collaborators Tony Levin (bassist with King Crimson and Peter Gabriel), percussionist Vinny Sabatino, pianist Michael Whalen, and guitar/synth master Randy Roos, Durant has recorded with Colin Edward of Porcupine Tree, electric violinist Caryn Lyn, and many others. At EQ2011, Durant will perform with his son Harrison accompanying him, as the duo interface their liquid guitars within the labyrinthine environment of the iPad. MARCUS FISCHER is a musician and multimedia artist currently based in Portland, Oregon. While drumming in various bands in and around his prior residence in Olympia, Washington, Fischer discovered new opportunities arising for him to further experiment with sound using tape loops and electronics. Field recordings, chance, and DIY instruments, coupled with acoustic instrumentation and visual art, define what has become Fischer’s minimal signature. Fischer curates vision+hearing, a series of audiovisual events that bring musicians and filmmakers together for collaborative performances, and is the co-curator of SIX, an annual six-speaker surround sound performance series, and has had the opportunity to score various short films and multimedia performances. Past musical releases include his recent Monocoastal on 12k, Arctic/Antarctic (Luxus-Arctica), contributions and remixes to various compilations and net labels as map~map, various untitled 3” CDRs, and two CDs as part of the duo Unrecognizable Now. MEM1, the husband and wife team of Mark and Laura Cetilia, seamlessly blend the sounds of cello and electronics to create a limitless palette of sonic possibilities in their improvisation-based performances. They use custom hardware and software in conjunction with a uniquely subtle approach to extended cello technique and realtime modular synthesis patching, which results in the creation of a single voice rather than a duet between two individuals. Their music moves beyond melody, lyricism and traditional structural confines, revealing an organic evolution of sound blending harmony with cacophony. The duo have taken part in residencies at Harvestworks in New York, STEIM and Kunstenaarslogies in the Netherlands and USF Verftet in Bergen, Norway. In 2009, they created a site-specific installation for the Museums of Bat Yam (Israel); their collaborative works with media artists Kadet Kuhne and Liora Belford have been screened and installed at venues including the Sundance Film Festival, Fringe Exhibitions (Los Angeles), and the Hordaland Kunstsenter (Bergen). Throughout their career, they have collaborated with a variety of artists including the Penderecki String Quartet, Steve Roden, Jan Jelinek, Frank Bretschneider, and Stephen Vitiello, amongst many others. NEIL NAPPE is an accomplished guitarist and synthesist whose pioneering work dates back to the 80s and his seminal release on Larry Fast’s Audion label, July. Spending years refining and applying numerous approaches, techniques and disciplines to the performance capabilities of synthesizers and interactive guitar playing, Nappe’s keen ear for texture and nuance has set him on a course that breaks with any established genre boundaries or confines. His dazzling work with guitar synths, generating loops and triggering samples to yield intensively immersive waves of undulating notes and frequencies, have rightly drawn comparisons with like-minded texturalists Robert Fripp, Manuel Gottsching, and Richard Pinhas. Equinoxygen will mark Nappe’s eagerly anticipated return to live performance after a 15-year-plus hiatus. RICHARD LAINHART is an award-winning composer, author, and filmmaker, a sonic artisan who works with audio and visual data, expert in processes both analog and digital. Since childhood, he’s been interested in natural processes such as waves, flames and clouds, in harmonics and harmony, and in creative interactions with machines, using them as compositional methods to present sounds and images that are as beautiful as he can make them. Studying composition and electronic music with Joel Chadabe at the State University of New York at Albany, Lainhart has gone on to compose music for film, television, CD-ROMs, and web-based applications. His compositions have been performed in the US, England, Sweden, Germany, Australia, and Japan; recordings of his music have appeared on the Periodic Music, Vacant Lot, XI, Airglow, Tobira, Field Studies, Infrequency, VICMOD, and ExOvo labels. As an active performer and composer of over 150 electronic and acoustic works, Lainhart has appeared in public approximately 2000 times, and worked with such notable musicians as John Cage, David Tudor, Steve Reich, Phill Niblock, David Berhman, and Jordan Rudess, among many others. Lainhart has also recently the CD, Polychromatic Integers, on OTP’s Periphery label. STEPHEN VITIELLO is an electronic musician and sound artist who transforms incidental atmospheric noises into mesmerizing soundscapes that alter our perception of the surrounding environment. He has composed music for independent films, experimental video projects and art installations, collaborating with such artists as Nam June Paik, Tony Oursler and Dara Birnbaum. In 1999 he was awarded a studio for six months on the 91st floor of the World Trade Center’s Tower One, where he recorded the cracking noises of the building swaying under the stress of the winds after Hurricane Floyd. As an installation artist, he is particularly interested in the physical aspect of sound and its potential to define the form and atmosphere of a spatial environment. This year has seen the CD release of MOSS (with Molly Berg, Olivia Block & Steve Roden) on 12k, plus collaborative work with Machinefabriek and Lawrence English; exhibitions include sound works hosted by Museum 52, and the first aural exhibit to grace New York City’s celebrated High Line park. Vitiello has collaborated with such musicians as Pauline Oliveros, Scanner, Steve Roden, Frances-Marie Uitti, Andrew Deutsch, and Yasunao Tone. He is currently an Associate Professor of Kinetic Imaging at Virginia Commonwealth University. TAYLOR DEUPREE is a sound artist, graphic designer, and photographer residing in New York. His solo works in recent years have explored a fusion of digital sound manipulation with organic and melodic textures that take influences from his interest in architecture, interior design, and photography. Themes of minimalism, stillness, atmosphere, nature, and imperfection prevade his work. In 1997, he founded 12k, a record label that focuses on minimalism and contemporary hybrids of acoustic and electronic music. Deupree has released over seventy CDs on the label by a roster of international sound artists and has developed 12k into one of the most respected experimental music labels in the world. Since 1993, he has released critically acclaimed recordings for labels worldwide including Spekk, Plop, Ritornell/Mille Plateaux, Raster-Noton, Disko B, Sub Rosa, Room40, and many others. Over the years, Deupree has collaborated with artists such as guitarist Christopher Willits, Kenneth Kirschner, Tetsu Inoue, Frank Bretschneider, Richard Chartier, and Stephan Mathieu. Deupree feels the importance of collaborative work is not to layer two individual styles but rather to fuse each artist’s concepts to forge a unique, third identity. THE ELECTRIC GOLEM is comprised of James Spitznagel and Trevor Pinch, who yield generative, modern psychedelic mindscapes thanks to Pinch’s command of his Moog Prodigy and homemade modular synths, and Spitznagel’s battery of similar devices like the Evolver, Mopho, Tenori-on, Nintendo DSi, iPod Touch, and Orb Sequencer. During his daylight hours, Pinch is Professor of Science and Technology Studies and Professor of Sociology at Cornell University, and the coauthor of perhaps the definitive book on synthesizer technology, Analog Days: The Invention and Impact of the Moog Synthesizer. Spitznagel is a true techno-polyglot, a digital computer artist, photographer, and sonic provocateur who has released all manners of twisted electronica on his Level Green imprint, and continues to raise the bar for circuit-based music as he craftily wrestles with the vagaries of tone, glitch, frequency, and pulsation. The duo recently released Sky Snails, their 2nd CD and the first release on OTP’s Periphery label. VIC HENNIGAN is a practicing Buddhist, artist and spiritualist who contemplates the state of humanity through his music. “Many of us have lost our connection with ourselves, the planet, the universe and those around us. My intention and purpose is to create and bring forth music for dance, for harmony and for spiritual connection.” Hennegan’s work as a live performer makes him a rare commodity in the electronic world. With computers, samplers, vocals and synthesizers, Hennegan’s instinctive hand creates techno-trance and ambient music as a wildly pleasurable, uplifting experience that will take your soul on a journey to the center of ecstasy. Hennegan’s music emanates a unique warmth which moves the listener to a state of euphoria. Aside from working with vocalists Juliet Annerino and Becca Fuchs, Hennegan is also a member, along with frequent partner-in-sound Dean De Benedicitis, of Los Angeles’s Fateless Flow Collective.